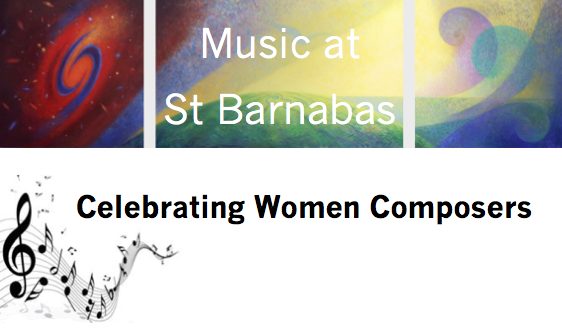 Join us on Thursday 26th May (7.30pm) as violinist Miriam Kramer, Cellist Mayda Narvey and pianist Charis Hanning explore the work of women composers from the 12th Century mystic Hildegard von Bingen to contemporary American composer Deborah Netanel. The evening also includes readings by women writers throughout the ages. Tickets are available on the door at £10 (£8 for seniors, £5 for under 16s). All profits will be donated to Ibba Girls’ School. We are studying” I am with You’, by Kathryn Greene-McCreight , which is The Archbishop of Canterbury’s Lent book. We begin our course on Wednesday 24th February at 8pm; In the Upper Room. Please let Ian or Joy know if you want to join us. Another option for those who would like to do some daily reflections is to follow Reflections for Lent , from Church House publishing; which is also available on kindle or an App. Features reflections by Andrew Davison, Paula Gooder, and others. Join us at St Barnabas at 7.30pm on Saturday 30th January to watch ‘Between The Lines’, a passionate one man play about the war to end all wars written and performed by Simon de Deney (50mins). A keeper of the graves in an old war cemetery is compelled to unravel a 100 year mystery. The play follows an underage soldier’s journey through the First World War as he struggles to deal with the impact of his choices on the people he loves most and his own sense of betrayal. Tickets are available to purchase on the door for £10 (concessions available). The Meaning is in the Waiting, By Paula Gooder. 10am: Morning Prayer with reflection. 12 noon: Midday Prayer with reflection. If you wish you can bring a simple lunch to eat in the patio room. 4.30: Night Prayer with reflection. All worship and reflections will be in the Lady Chapel. We sincerely hope that you can join us at this year’s Christmas Fair. There will be the usual range of stalls and good food at reasonable prices, and the chance for children to meet Father Christmas. This year we are particularly excited that the young magician, Eddie Farmer, will be joining us and performing live magic throughout the fair! It’s Christmas Fair time again! As with last year, profits will be going into our fundraising appeal coffers to improve our church buildings. This year we have the excitement of a young MAGICIAN, who will be performing at intervals throughout the event, plus, as always, delicious lunches provided by Ali / Sarah and the team. Find out more about how you can help on the day. So wrote Alessandro Striggio in his libretto to Monteverdi’s Orfeo, the Prologue of which begins this concert. Spanish and Latin American music, including Piazzolla’s stirring Libertango and folk songs are juxtaposed with Bach’s sublime Adagio from the Concerto for Oboe and Violin and other music of the 17th and 18th centuries. Poet Peter Brennan reads from his own work and that of other poets who contemplate the guises in which music calls out to all of us. The concert will be followed by a glass of wine. Admission at the door £10, concessions £8. 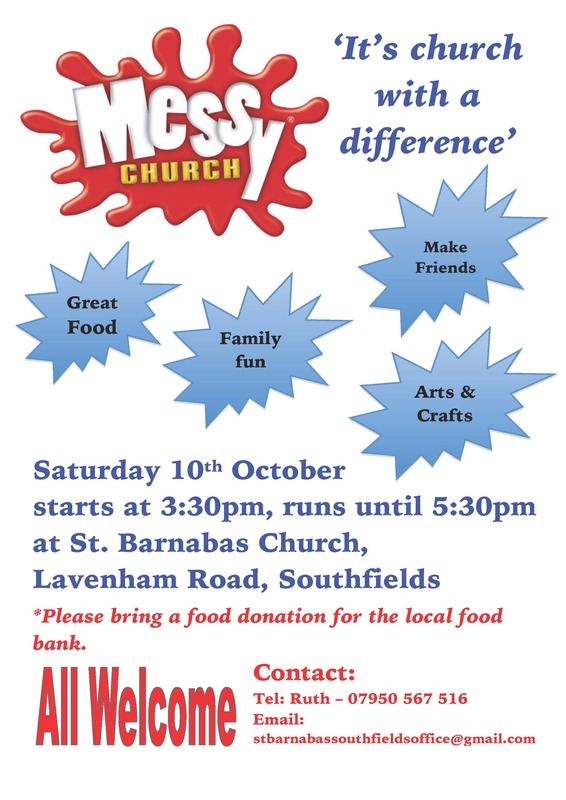 Please join us this Saturday for Messy Church. All are welcome, and it is an opportunity for people of all ages to worship together. Back by popular demand, the 2nd Southfields Harvest is on Saturday 26th Sept from 12.00-3.00. 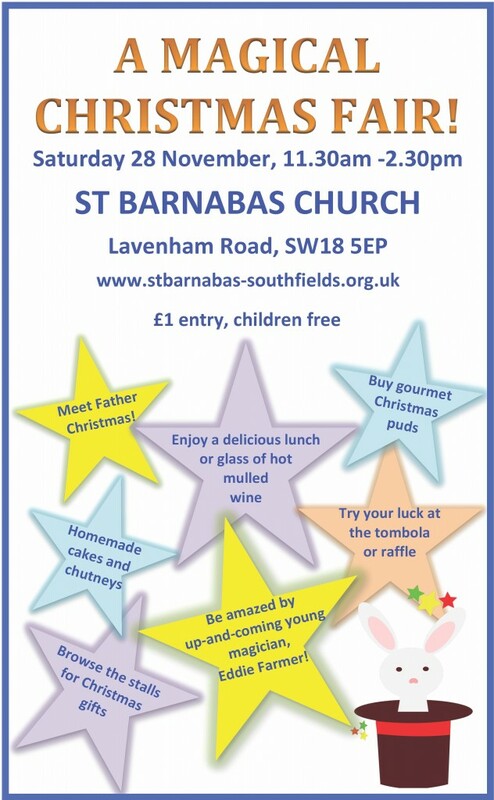 Venue: St Barnabas Church, Lavenham Rd SW18. You can sample locally brewed beer from the Rocky Head Brewery, bring your apples to be juiced by Abundance Southfields, buy produce grown on local allotments, meet friends and neighbours over a sizzling Southfields sausage or tea and home-made cake. There’s also crafts for kids, baking and preserving competitions and hopefully some live music (if you are part of an acoustic music group and might be interested in playing, do get in touch). Free entry and any profits will go to local charities. Visit southfieldsharvest.weebly.com for more information.